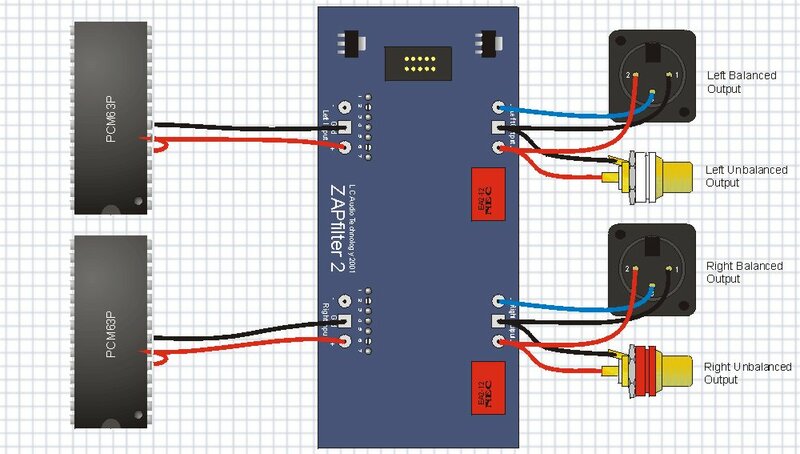 Here you can find all necessary information to connect ZAPfilter 2 to a number of the most common DAC chips. So for ZAPfilter we normally do not supply CD model specific instructions, as they are not needed. 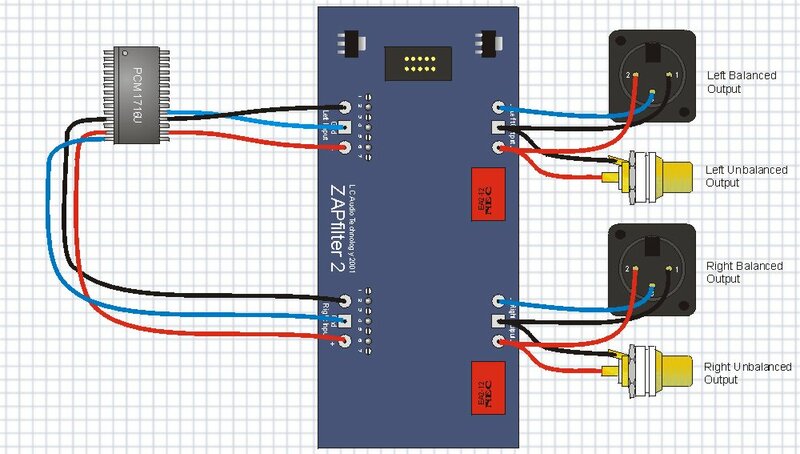 Instead determine the DAC type of your CD player, and hook up you ZAPfilter as shown. If you did not find the right DAC chip on our list, please send us an e-mail, and we will try to help you. Sony XB930, Change R381 to 10k0 on main board. If you follow this checklist, you are sure your ZAPfilter installation will work correctly every time! 1..If your DAC is not on the list above, you can often go to the producers homepage and download a datasheet, which will show you the correct hook-up pins of your DAC chip. Or you can determine the DAC type and connections from the way it is hooked up to your existing analog stage. We use this method in any case, as it is the fastest and always precise. See below. 2..Connect the ZAPfilter input terminals to the DACs output pins. 3..Disconnect the old analog stage, you might want to remove any analog stage IC's in connection with the DAC chip. 4..Connect output of the ZAPfilter directly to the output plugs of your CD player. Make sure none of the old analog stage is still connected to these plugs. 5..Double check that no signals and grounds have switched place at this point. Voltage Output DAC : short 2, 4 and 6. I.e. SM5872, CS4390, CS4329, TDA1315T. Current Output DAC : short 1, 3, 4, 5 and 7. I.e. PCM 1702, PCM 1704, all SONY DACs, TDA1547, AD1862. 7..Mount the power supply and transformer with the supplied screw, connect mains voltage to the power supply, with a voltage after the CD player's mains power switch, so the ZAPfilter is turned off, when the CD player if turned off. 8..Connect the 10 pole flat cable between ZAPfilter and the power supply. 9..Turn the CD player on, check for DC on the output terminals, using a Voltmeter. 10..Connect the CD player to a stereo system, check for background noises or humming. Identification of DAC type and connections. 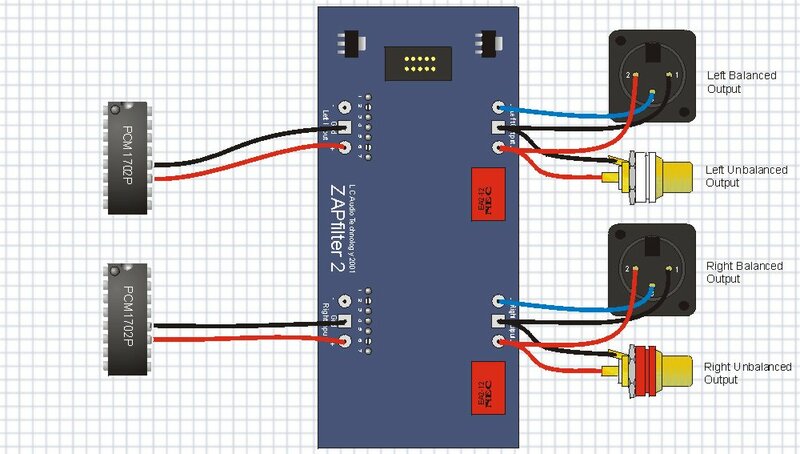 You can use this method to identify any DAC type and its connection point to ZAPfilter 2, just from the way it is connected to your present analog opamps. We use this method every time we install a ZAPfilter, as it is quick and simple. Look on your circuit board, and draw on a piece of paper the connections between the DAC chip and the first opamps. You should end up with something similar to one of the below examples. If you don't know which one is the DAC chip, simply follow the connection back from the phono plugs on the rear plate, through circuits, until you run into a chip with more than 8 pins. In some special cases the DAC chip can also have 8 pins, in this case it is either a Philips TDA85xx or a Burr Brown chip (can not be an op-amp). Most opamps have 8 pins, and their connections are as shown on each example (seen from the top of the chip). Remove the first op-amps (those shown on the examples) and any extra components that are connected to the signal wires, and the op-amp. Such as capacitors connected to the opamps and the signal wires. Also any resistors connected to GND should be removed. Capacitors connected from signal wires to GND should be left in the circuit. The component values we state on the examples are not exact. 7k5 may be anything from 3k to 10k, and 33R can be 10R or 100R, but you can clearly distinguish the circuits from these part values. Also the 47uF capacitor used in example 5 can be 22u or 100u as you like. It is not critical. Page Build Completed in: 0.011 seconds. .